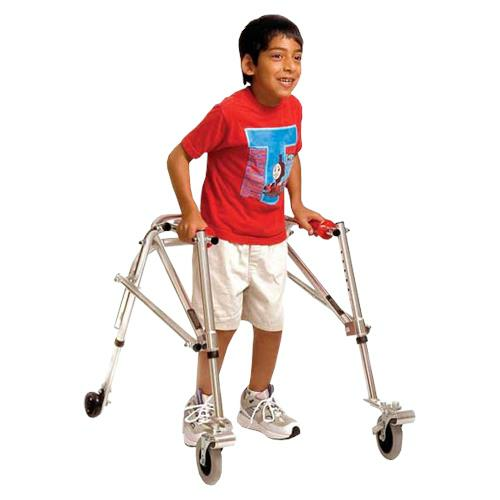 Kaye Wide Posture Control Four Wheel Walker With Front Swivel And Silent Rear Wheel For Youth comes in a wider width to accommodate users who wear hip-knee-ankle orthoses or who have wide hips and need additional space within the walker frame. This walker has latex-free handgrips which are particularly suited to children with spina bifida who have latex allergies. Buy this product and earn 20.07 Reward Dollars. Note: Optional All-Terrain wheels can replace those in swivel walkers, but the All-Terrain wheels will not swivel. Height to top of handle (Floor to Mid-buttocks) 19" to 25"
Depth from Front of Grip to Rear Bar 10.5"